People are off work. Disney California Adventure closed a few hours ago. Disneyland is packed. The buzz on the inside is that we've reached capacity. I'm also hearing that freeway traffic leading in and out of the Disneyland Resort is nightmarish. None of this comes as a surprise from where I sit. I'm back at my mobile office next to the payphones on Big Thunder Trail. Steady streams of guests continue to roll by. Ride queues are long. 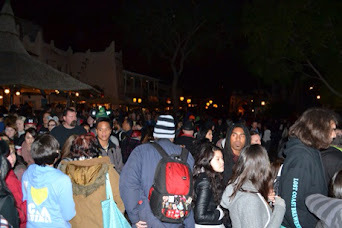 Navigating the pinch points in New Orleans Square and Adventureland is a major challenge, especially with people already settling in for a special 1:00 a.m. performance of Fantasmic! on the Rivers of America. It's pretty crazy. And we've still got over seven hours to go. Whether all these people are intent on staying until 6:00 a.m. remains to be seen. 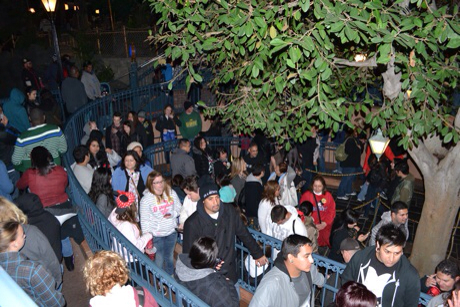 We're hoping for a mass exodus at the conclusion of Fantasmic! Regardless, whoever remains after the pyrotechnics is likely staying for the duration. Crowds are immaterial at this point. We're staying to the end whether there are 50 people here or 50,000. This is madness. This is fun. But, what do I know? I've been up since 4:00 a.m.